Infinity Aquarium Design of Los Angeles has created some of the most breathtaking custom saltwater and freshwater aquarium designs in Southern California. We specialize in creating all types of aquariums that are unique and that blend seamlessly into your new or existing living space including hobbyist aquariums for your home and beautiful commercial aquarium displays for your restaurant, hotel, office, or any other business. No matter where the location, your custom aquarium design will become the living, breathing centerpiece of any room. The eco-friendly and synthetic recreation of the tropical coral reef with the benefit of no restrictions on your selection of fish! 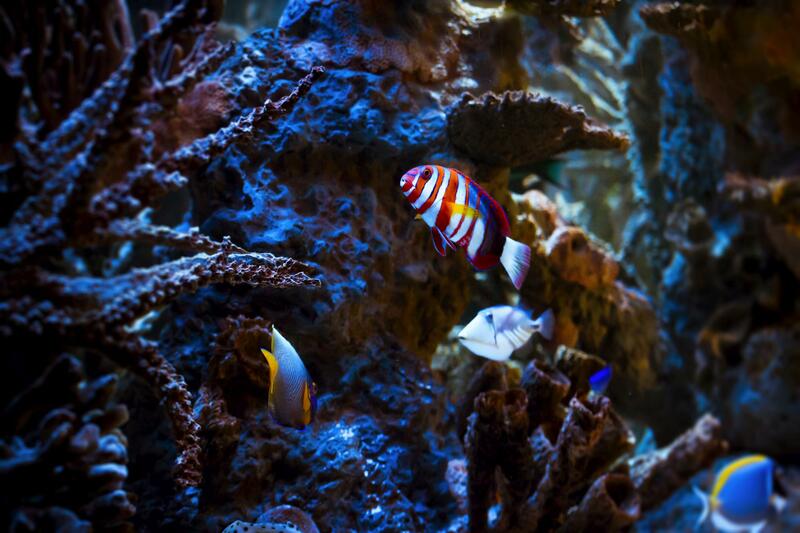 Real coral pieces harvested humanely from the Indo-Pacific region and assembled to create a realistic ocean aquascape. An organic ecosystem that showcases every aspect of coral reefs- live corals, crustaceans, and invertebrates thriving together. The lush, underwater garden that offers a tranquil, organic, and soothing approach to the natural, freshwater habitat. Check out more details about the types of aquariums we offer below or contact us to begin planning your custom aquarium design in the L.A. area today! The coral reef insert is a hand-crafted and extremely detailed synthetic recreation of the natural coral reef. Individual molds are taken from true coral skeletons and are then painted and placed in a manner in which they would appear in their natural ecosystems. 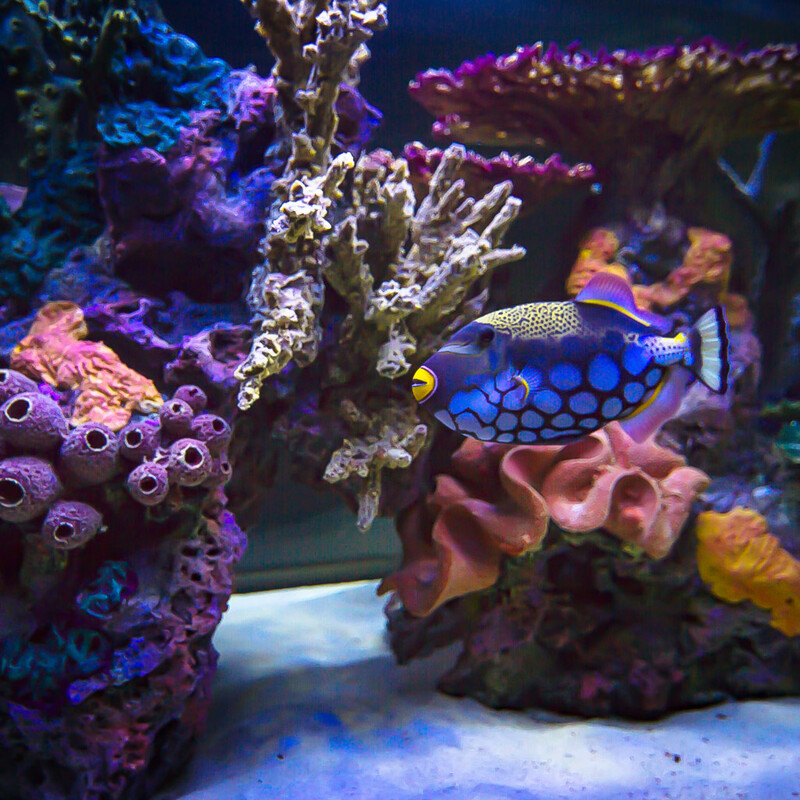 With their life-like appearance and vibrant color schemes, this creative option allows the aquarium owner to have the look of a beautiful coral reef without being limited on their fish selection. 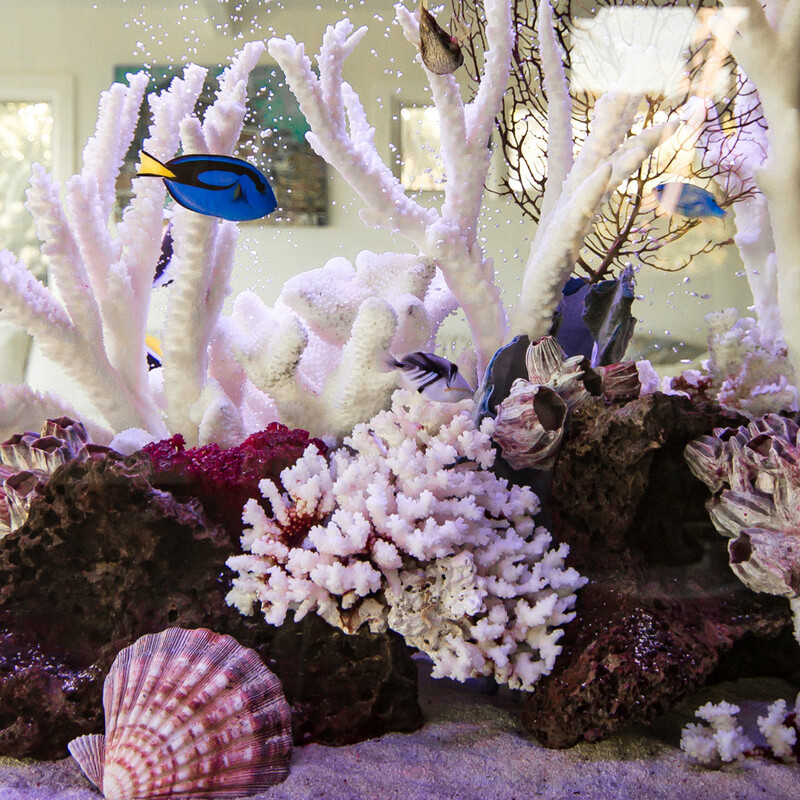 These types of aquariums are often times seen in public aquarium settings, the coral reef insert is considered to be an “eco-friendly” option. It delivers a similar jaw-dropping appearance of a living reef or decorative coral display without removing any animals from their natural environments. The decorative coral display is a very vibrant, dense, and hand-selected set of skeletal coral pieces that are harvested from living reefs around the world once they have expired an/or broken off of their location on the reef. They are bleached to reveal the most vivid whites, blues, and reds, along with a spectrum of many other colors in between, and give your aquarium a very bright oceanic look and feel! Often accompanied with various shells, barnacles, and seafans, the details and shapes of these beautiful coral pieces are very unique in every display! Because these coral pieces are extremely porous, they are easily saturated with algae growth over a period of a few weeks. 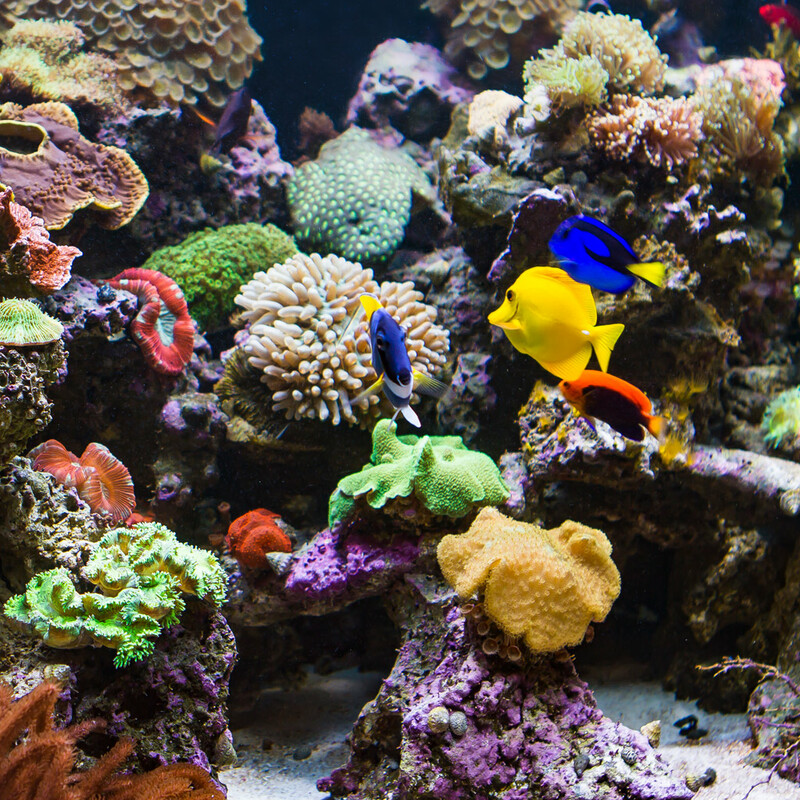 In order to combat natural algae growth, an additional coral set is strongly recommended for cleaning and rotation during regular maintenance visits to insure your aquarium remains pristine at all times! There’s something special about an aquarium from Infinity. Watching the fish swim just makes you feel more alive. The Living Reef Aquarium is a self-sustaining eco system that truly brings a slice of Mother Nature into the home or office. While most marine systems bring focus to the vibrant and exotic fish available from our oceans and seas, the reef aquarium offers a deeper glimpse into our oceanic worlds by focusing on the beautiful corals and invertebrates that thrive in shallow, tropical marine waters. The detail and intricacy of this environment produces a constantly changing world for the aquarium owner and slowly displays the maturation process of our coral reefs around the globe. Unlike fish-only saltwater aquarium designs, much of the emphasis is understandably on the coral life and architecture of the actual display. Smaller, more docile fish are introduced into the aquarium to provide added activity and specific colors that may be missing from the background. Void of any and all synthetic formations, the living reef aquarium’s natural foundation is pre-cured ocean live rock and the relationships between producers, consumers and detritivores is activated right before your eyes as your new reef aquarium will likely be home to many fish, corals, crabs, snails, shrimp, clams, mollusks, sponges, sea stars, urchins, and more! The Freshwater Planted Aquarium is an all-natural environment that gives you a glimpse into the tropical rivers and streams that flow through warmer regions of the world. You can think of it as the aquatic version of your backyard garden, with lush and dense greenery only to find schools of exotic tropic fish navigating the underwater aquascape. Planted aquariums begin with a foundation of various terrestrial and river rocks which are nicely accompanied by unique pieces of Asian driftwood that will truly give any backdrop an organic and custom look. These hand-collected pieces are then enveloped with different species of live plants and schools of exotic freshwater fish. Most of the fish suitable for a freshwater-planted aquarium tend to be on the smaller side due to the destructive nature of their larger counterparts. The freedom to stock the aquarium with smaller species allows the owner the possibility of attaining one or several schools of fish, and the ability to observe their natural behavior in this functioning ecosystem. 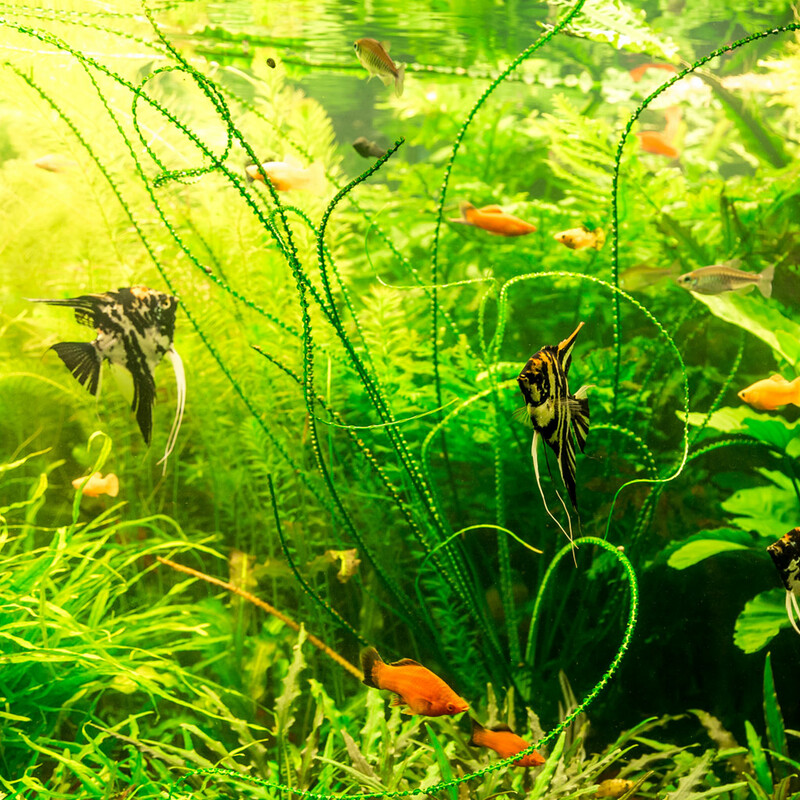 The dynamics of freshwater aquarium designs are no different than what would occur in the wild. The availability of plants to filter the aquarium water negates the need for a dedicated bio-filer. It is actually the plants ability to release oxygen for the fish and utilize the nutrients in the water that establishes and maintains the ecology of the environment in these types of aquariums. The result is a calming and ethereal presentation that stands out from your average “fish tank”.